I have two Garbage Dogs, Fate and Bud. All I have to do is say, “hey, let’s go to the dump,” and the two race for the door, rush to the car and hop in as soon as the door is open. On the way they start intently at the roadside, getting more and more excited as we near the town recycling center, one known as the town dump. By the time we pull into the dump, both dogs are besides themselves, squealing, whining, wagging their tails. There, their friends Bob and Devon are always waiting for them, they have a can of biscuits by the cash register and each comes out to give Bud and Fate a biscuit, sometimes a donut. Once, Bud got so excited he just jumped out of the window and was shocked to find himself on the ground outside the car. He was happy to hop back in. I keep the windows high. I took this photo today at the dump, I had biscuits in one hand, the Iphone in the other. My little terrier mix, Tiny, was a skinny stray when we adopted her but even though it was obvious she had spent a long time without adequate nutrition, she always ate slowly and carefully and would sniff her food before eating it. Because of that, I could never teach her to catch food in mid-air. My Airedale, Heidi, on the other hand, came from a wonderful breeder and had never known hunger in her life, but she is the biggest pig of a dog you could imagine. Her mantra about food is “anything anytime anywhere”. Just goes to show how canine instincts differ from one dog to another regardless of circumstances. Bud and Fate have the right idea. Nobody ever gave me free food because I looked cute! Such a fun picture. Esecially responding to Fate’s “Devil Dog” look. Love following your dog stories, life, and picures. Thanks. This is a great shot! 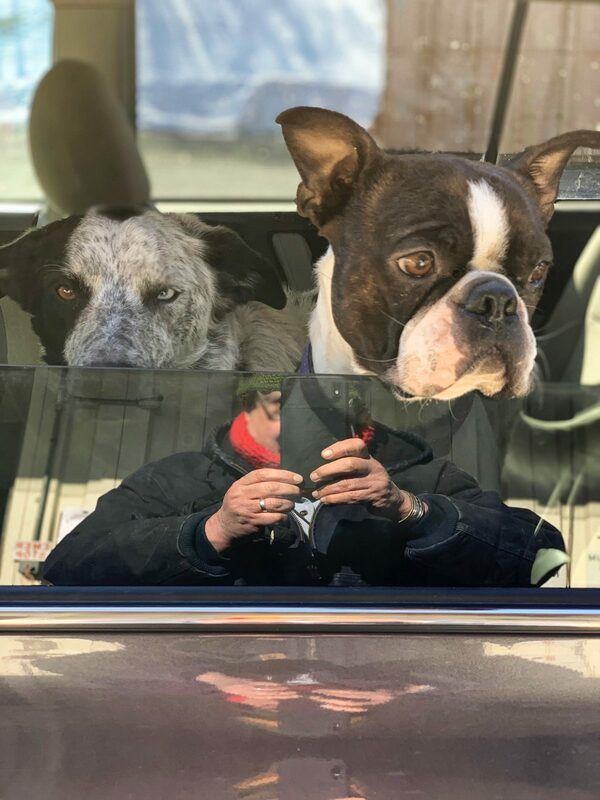 I love the reflection of your hands on the side of the car……and of course, the big dog heads. This is an incredible photograph! It tells it’s own story visually. Thank you for posting this, Jon.